✔ All-Purpose Gloves: Suitable for Weight Lifting,pull up & general workouts, bodybuilding, exercise, fitness and gym training,etc. Designed to get the perfect fit for MEN/WOMEN/trainers/athletes. ✔ Durable Microfiber Material: Made with high quality lightweigh microfiber to allow for a comfortable workout. Double stitched and built to last ideal for heavy lifting or if you want extra support/protection. ✔ Dual Velcro Straps And Breathable Mesh: According to your own demand to adjust the degree of tightness and stabilize and secure the wrist. Permeable ventilated mesh backing allows sweat to evaporate and hands stay dry. ✔ Get a Stronger Grip in Seconds: The special layer palm position has the advantage of wear resistant, antiskid function. Silica gel pads and dots provide friction to keep weights safely in your grasp. Pull Tabs on fingers and wrist make it easy to pull gloves off/on. 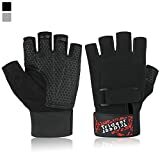 Trideer Weight Lifting Gloves, Gym training sport fitness bodybuilding workout exercise glove are ideal for men/women/ladies/female/trainers/athletes/beginners/fitness people. We know you need to support your wrists when lifting free weights, protect your hands while doing your forearm headstand, and comfortably fold your knuckles when delivering that hook punch – all while maintaining a sense of cuteness. We get it! Our gloves are made from breathable material so your hands won’t overheat, while the padding on the palm protects and helps to hold your grip.